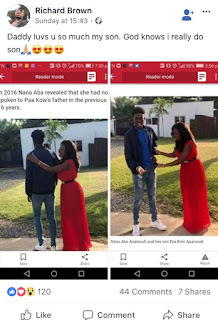 Most Ghanaians know Nana Aba Anamoah as a “Born One Celebrity”. Hell, she makes jokes about it on Twitter often. She once admitted that she got pregnant when she was in Senior High School stated that she does not want to talk about the man. From what has been gathered, after impregnating the “innocent Nana Aba Anamoah” back in the day, he vanished broad to pursue his dreams. But Nana never gave up and kept on ‘grinding’ for a better life for herself and her son. Now she is regarded as one of the top female journalists in the country if not the best and highly valued. Well, Barely a week after posting photos of her now handsome boy which even got fans fighting over him, the mysterious man has shown up. He is in the person of Richard Brown popularly known as Osibo among his friends and he says not only does he love his son dearly despite his absence, he wants to talk. According to our sources, Mr. Richard Brown has already spoken to a couple of blogs who are yet to publish his side of the story. 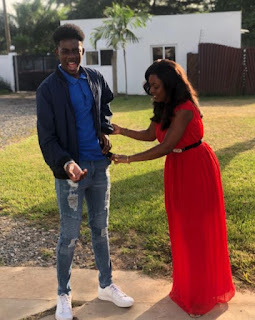 But he has already sparked anger among Nana Aba Followers on social media with his latest post on Facebook. According to the man who from all indications is wealthy, despite all ‘issues’ he loves his son. Considering how he vanished and now claiming father of the year award, no wonder people are already tearing him apart on social media. 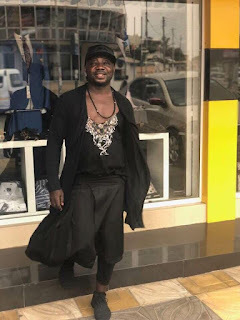 From what we understand about Mr. Brown, he sells fashion items in Ghana now after living long years in Italy and as stated earlier he looks rich.